The Gentoo Qt maintainers have been doing a fantastic job of getting cutting edge Qt software into shape with the qting-edge overlay. I've been running Qt 4.5 since beta1 and am pleased with the direction it is going. Recently the devs bumped the Arora ebuild to version 0.5. Arora is a lightweight browser based on Qt and WebKit. I must say, I am impressed. This browser is lightning fast. The interface is pleasing, yet minimalist. 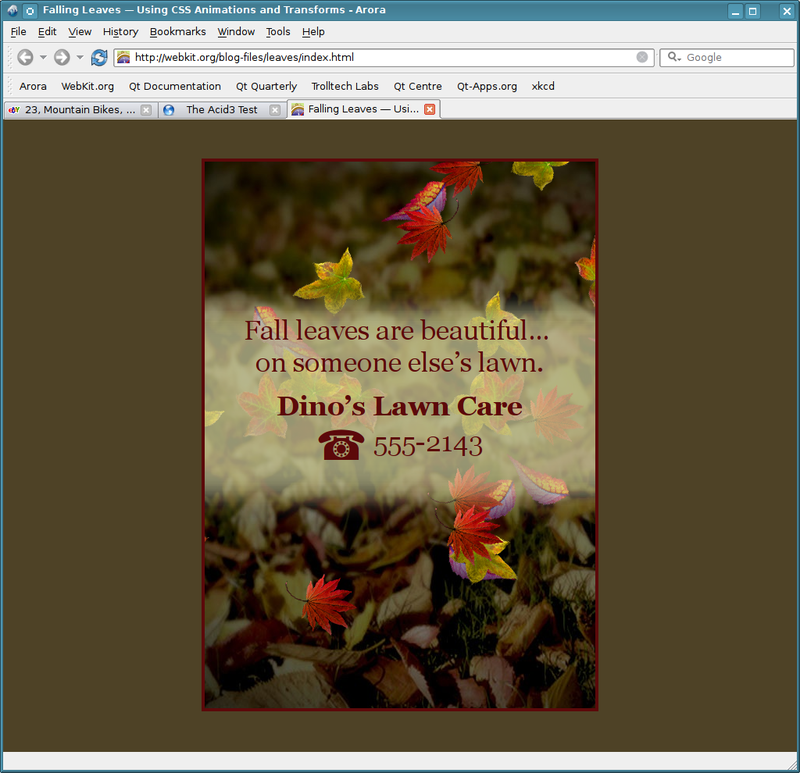 You get all the benefits of recent WebKit, and the nice cross-platform nature of Qt. It feels much faster than Konqueror4.2, and the recent WebKit engine means better compatibility. 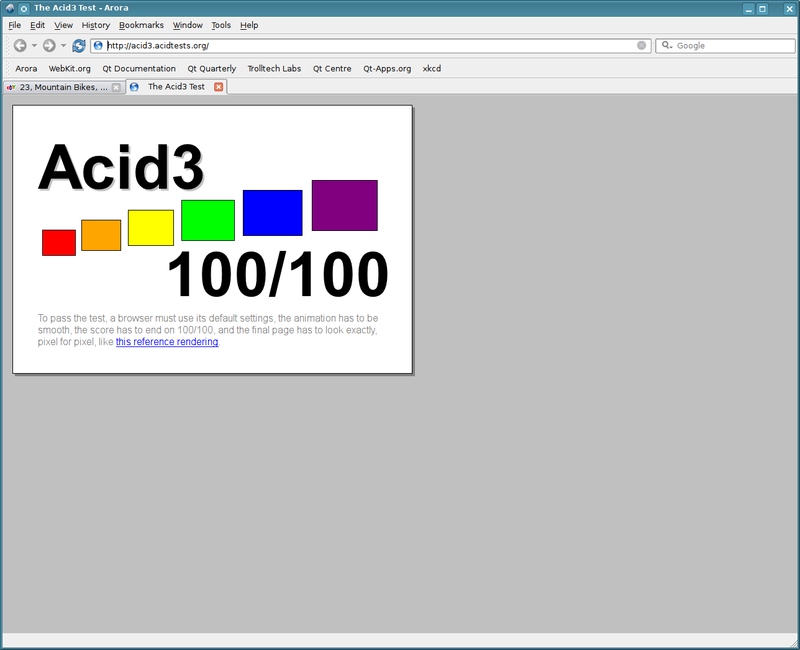 It works with all the sites I've thrown at it so far and performs great on the Acid 3 test. All in all it reminds me of Firefox's early days. Very mean and lean. Firefox 3.1 beta2 has served me pretty well, so I don't think I'll abandon it yet, but WebKit browsers are becoming quite compelling. The WebKit devs are also pushing some interesting new ideas out with CSS animation. 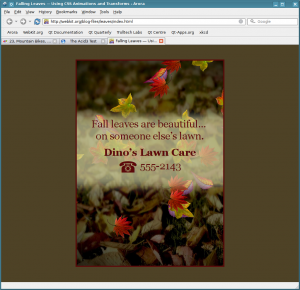 This example gives Flash-esque falling leaves. Maybe we will see less reliance on Flash in the future with the new video/audio tags and work such as this. It would be nice to move presentation back into structured [X]HTML and CSS, which is portable, easier to parse, and light weight. I've seen it hit Fedora Rawhide recently as well.